Underwater photography can be a fun and exciting activity for your kids. This is particularly true if your kids are fond of underwater creatures and plants. So what better way to help them enjoy the hobby all the more with a trusty underwater camera? These devices are pretty accessible these days, allowing you to find loads of great choices pretty much anywhere. The best underwater cameras for kids can be a good investment, not just honing your kid’s skill for photography but reinforcing their appreciation for technology and nature all at the same time. So if you’re hoping to find that sure winner in a sea of vast choices, our review on the 5 best underwater cameras for kids should help you land a solid choice. 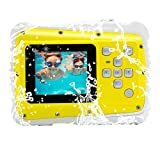 Vtech is one of the leading brands when it comes to manufacturing infant to preschool age electronic learning products. They bank on the superb video technology capability, hence the brand name VTech. 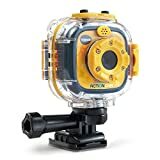 They make great quality underwater cameras for kids too, making them number one on this list. The Vtech Kidizoom Action Camera is a highly durable underwater camera that works with great even with minimal lighting. The top rated camera is one of the most impressive on the market today, allowing kids to take images underwater up to 6 feet deep. While it can also snap pictures, it was designed for underwater video recording. The device features a 1.4-inch color video camera LCD screen that allows users to preview saved videos and photos with clear detail. Several other features also allow you to do anything from stop-motion videos to time-lapse photos. These are great features that can teach your kids the ropes of technology, allowing them to explore different photography outcomes with a simple yet versatile device. In terms of sound quality, the VTech Kidzoom doesn’t disappoint. Videos come out with superb audio, recording sounds to give you nothing short of the best video output. Video quality is just as impressive, capturing subjects in clear and crisp detail. Finally, the digital zooming capability of the Kidizoom Action Camera makes it a perfect underwater camera for your kids as it can close in on an object under the water and magnify it up to 4 times. A waterproof case making it virtually indestructible. 2 mounts that can attach the camera to bikes, surfboards, and skateboards for hands-free use. Powered by a rechargeable li-ion polymer battery which can capture for 240 minutes of video or take 278,000+ photos underwater. The 32GB microSD is sold separately. Intova has been ranked as one of the leaders when it comes to underwater cameras. The company has produced a number of affordable underwater cameras that compete closely with a number of other top picks on the market. What’s more, the brand has also been known for their camera accessories which are designed to extend the functionality of a lot of their camera releases. Based on our research, the Intova Duo Waterproof Sports Video Camera is one of the best underwater cameras for kids. It has a built-in lighting and can easily capture high speed action without the need for any advanced camera operation skill. This makes it a perfect companion for kids who are just starting to learn the ropes of using their own camera. The device also features several provisions for mounting, making it a reliable companion for kids who want to record themselves while performing sports like wakeboarding or surfing. Plus, the mounting also makes it possible for users to attach the camera to an action camera pole, so you can capture hard-to-reach subjects without having to put yourself in harm’s way. With 720p video resolution, the device makes it easy to capture crisp, clear, and beautiful images with ease. Lastly, you won’t need to worry about the camera breaking at the hands of careless kids because the construction was designed to be completely shock resistant. Very compact and rugged, can be used for underwater video recording or taking photos up to 100 feet. It has a 1.77-inch LCD screen which has an extra feature for playback monitor or as a viewfinder, making it easy to use even under water. Perfect digital zooming capability of up to 4 times with burst mode included. Wrist lanyard included in the packaging. Designed to float, so you won’t have to worry about losing it in case your kid accidentally lets go of the device while under water. Battery life is only up to 2 hours max. Powpro underwater cameras have been invading the online market for some time. Lots of their designs are made to withstand the onslaught of a lot of different possible damages, so the rugged devices are perfect for kids that might not be the most careful with their stuff. The KFun PP-J52 Underwater Action Camera features a 2-inch screen that gives users a pretty impressive preview of captured images for a more enjoyable user experience. The sensor in the camera can focus on subjects up to a distance of 1.5 meters, which is pretty impressive considering the fact that they’re used underwater. Some other features that make it a big hit include its self-timer feature and built in microphone and speaker. It can support for up to 32GB TF card which can easily store all your kid’s captures and video recordings. Plus, the device also boasts the capacity to correct and adjust lighting automatically, so your kids don’t have to get into the complicated technicalities that they might not yet understand. 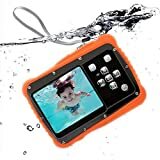 2-inch screen with 960×240 screen resolution and can use software interpolation 12M for 4000×3000 quality, making it the only HD action camera for underwater usage for kids. Self-timer option of 2/5/10 seconds and shutter speed of 1-2 seconds for easy capture. Effects are varied: automatic, night portrait, scenery, sports, beach, underwater, high sensitivity; with 4x digital zoom. Its battery life is relatively subpar compared to other options on the list. Vmotal is yet another big name when it comes to making easy to use, underwater cameras for kids. They provided millions of customers a wide range of options that come at fairly affordable prices. Vmotal cameras are stylish, sleek, and fashionable, which of course appeals to lots of kids who put emphasis on aesthetics. The Vmotal Waterproof Digital Camera Camcorder is the front liner when it comes to underwater video recording and photo capture. At only 80 grams, the device is very lightweight and thus very easy to bring around. 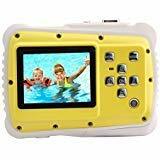 The device features 1.77 inch TFT LCD screen for better viewing, and an auto playback feature lets kids easily correct images and retake pictures to get the best possible outcomes with self-correction. The camera also has a super bright flash feature that makes it easier for your kid to capture a photo even with poor lighting conditions. Some other factors that make it a smart choice for kids include its auto shot mode feature, burst mode, video recording modes, time-lapse, loop recording feature, and even a slow motion option. The screen has an auto shut down that automatically turn the device off to help maximize your battery life. Despite having such a large number of features though, the device can be easily used by small children with little to no confusion. It is very light to bring around thanks to its compact and lightweight construction. The optical sensor resolution is at 8MP which is a lot higher compared to other choices. This makes pictures crisper and clearer for better outcomes with each snap. Controls are a little more advanced, which is perfect for kids who want to learn the ropes of photography and not just snap away. The device is a little on the pricier side of the cost spectrum, so it might not be the most budget friendly choice for buyers who don’t want to spend too much. iShare is a fairly new brand in the market which specializes in electronics and imaging devices. They’ve got quite a number of different products on the market today, but for our list, their iShare Kids Camera proves to be a worthy contender as one of the best cameras for underwater photography for kids. The iShare Kids Camera is – in a phrase – perfect for kiddie adventurers. The 720p resolution for video capture puts it right smack in the middle in terms of quality, so your kids can get some pretty decent shots with minimal effort. The built-in microphone is also equally impressive, recording clear audio with minimal noise and distortion. Equipped with a 4x optical zoom, the camera makes it easier for your kids to get up close and personal with a variety of subjects without having to leave their spot. The camera is also very light at 8 ounces, so it doesn’t really present too much of an issue in terms of portability. The iShare is also compatible with most operating systems making it easy to transfer files from the camera to your kid’s computer or mobile phones. Kids will love the simple buttons, avoiding confusion when taking photos and videos underwater. Plus, the device is also very durable, able to sustain high falls and impact without showing signs of damage. The iShare Kids Camera can save up to 240 minutes of video recording and up to 200,000 pictures. What’s more, your children can even experience the fun of editing pictures on the spot, with the camera providing different modes and options that allow children to explore their creativity after pressing the shutter button. 2-inch LCD screen, with auto playback options make it very appealing for kids who want to appreciate their pictures. 9.8 ft. underwater camera is perfect for snorkelling, diving or beaching. Waterproof, can withstand lots of falls or drops, very light at just 8 ounces. Night picture capture with bright flashes is perfect for night swimming. Very easy to operate even for kids as young as 3 years old. Has better quality photo than other cameras at 12MP. A little bit pricier than other choices. Limited battery life may be a hassle for some users who want to leverage the device for extended periods of time. Choosing the best underwater camera for your kids can be confusing. But by considering the features that you think your kid will truly enjoy, then the entire process can be a whole lot easier. Remember, above everything else though, it’s ideal that you choose a device that lets your kids see their favorite underwater sceneries and creatures in the best possible detail to help encourage their interest and hone their skills. So, are you ready to check out your options to find only the best underwater camera for the kids you hold near and dear to your heart? Make sure to check out our five top recommendations and get a gist of what a great underwater camera for kids should be so you can get nothing short of the best for your children.